I’ve got something to eat your brie with. It’s an artichoke! Yes, really. Get your brie cheese ready, boil your artichokes for 20 minutes to soften ’em a bit, then place both the cedar plank + brie AND artichokes on the barbecue at the same time. While everything is grilling, pour some wine. Or grab a beer! I recently had a lovely tangerine beer. 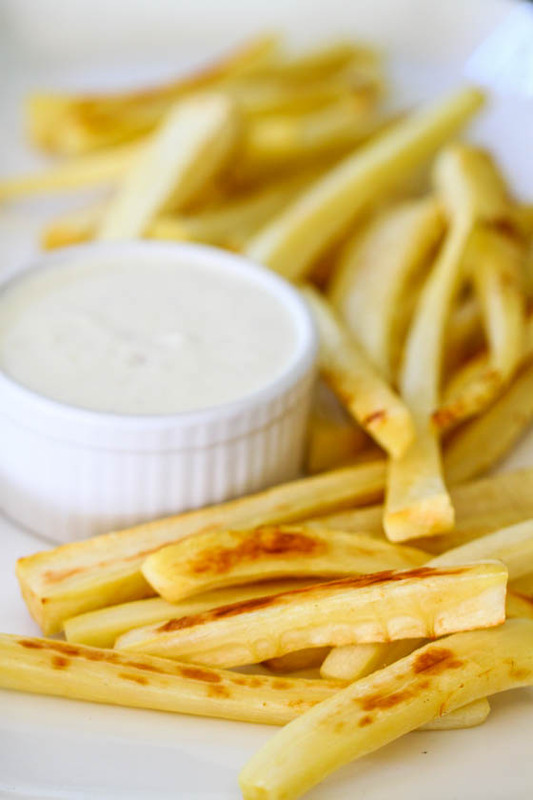 Now, spend approximately 30 seconds whisking together this quick and easy spicy lemon aioli. Get your trail mix and honey ready for the brie! Pull everything off the grill at once. Quickly pour the honey and scatter trail mix all over the brie. Serve the chokes with the aioli. Sip your drink, eat your melting cheese and dunk each tender artichoke leaf in this spicy, creamy dip. And who said multitasking was hard? 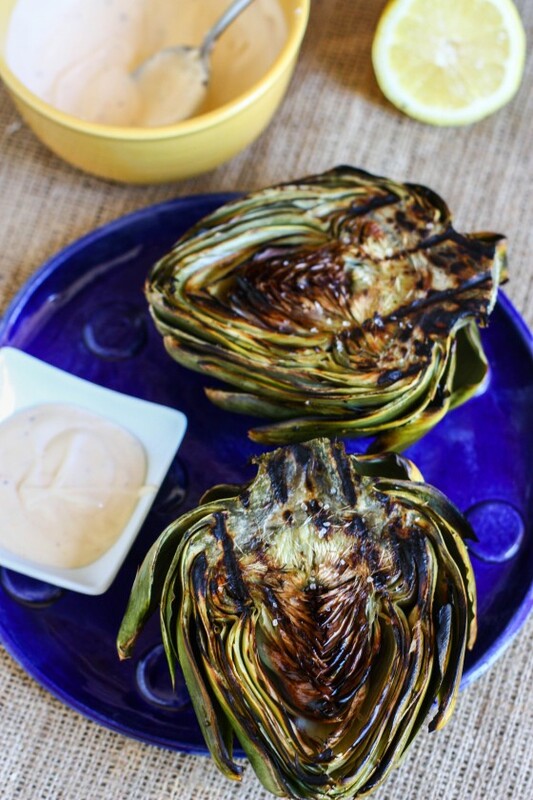 Recipe for the grilled artichokes + spicy aioli is over on the PBS Food Blog today! Get.it. Lost Coast Tangerine?? Look for a beer called Wheach! Peach wheat beer. That’s from O’Fallon Brewery, right here outside of Saint Louis. That stuff is gooooood! 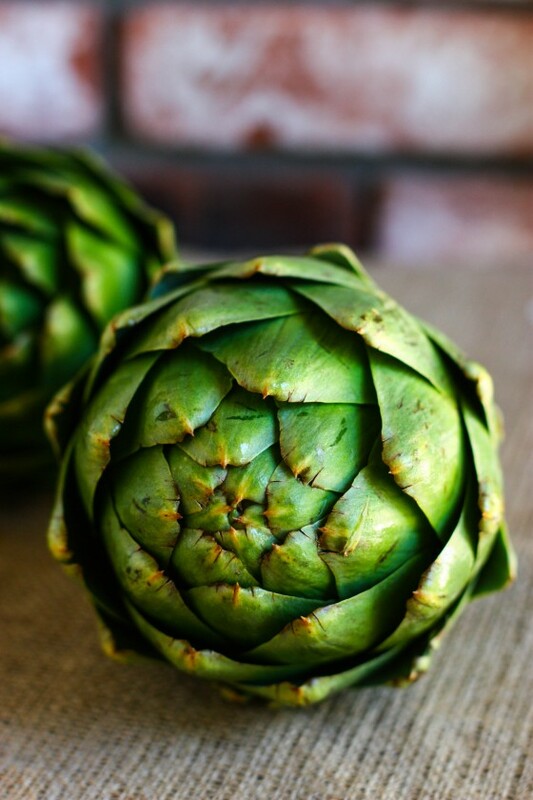 I’ve never had an artichoke before…but look how pretty these look. Makes me kinda want to try one! 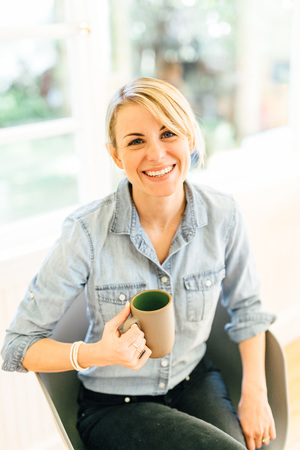 Thank you Jenna…Happy Saturday. When’s the new ELR site being launched? As soon as we finish it! I thought you said you hated beer?! I used to totally HATE beer!! But…we have been going to a few different breweries around here and I am actually starting to really like it now! so weird. I am the same way! Hated beer all my life, but now I am starting to like it for whatever reason. Have you ever tried Banana Bread Beer? Delish! I learned the beauty of artichokes while living in Cali. 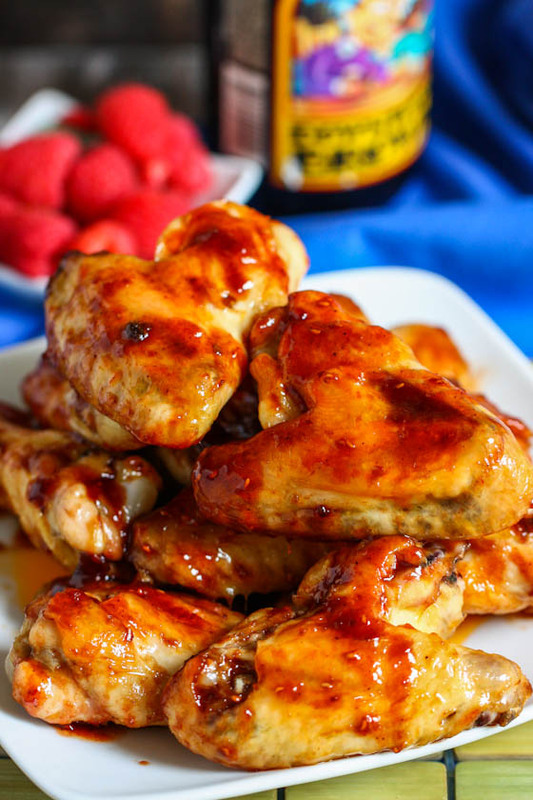 Totally love them grilled dipped in a mustard-butter sauce. Ever been to Rutherford Grill in Rutherford? Their veggie plate is TOPS. It has a grilled artichoke on it. To.die.for. yumm! the best artichoke i’ve ever had (besides the simple ones my dad and mom would make for us growing up with their secret dipping sauce) was at the ivy in los Angeles. i would probably never go back there for i believe it has turned into a paparazzi zoo, but it was SO good. pretty sure it was grilled but had some sort of herby-bread crumb thing going on. delish!! You’ve done it again Jenna! Posted one of my favorites like you’re reading my mind before I do!! Have a great weekend! 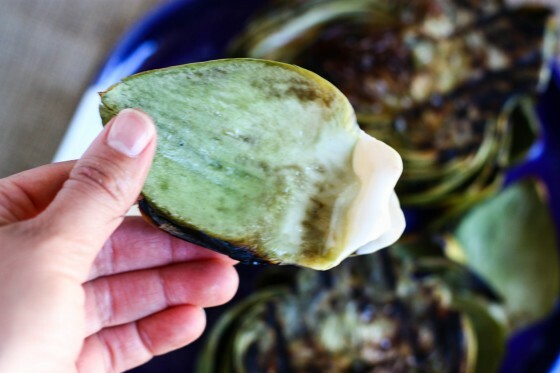 I’ve never actually cooked an artichoke – I love that you can just pop it on the grill like that! Never eaten a grilled artichoke…looks amazing! This makes me want to get over my grill fear…I’m always terrified I’m going to blow it up or lose my eyebrows or something. I would still love a grill tutorial!! Any interest??? I’m clueless!! I had no idea you could grill an artichoke! This looks phenom. yum! i love grilled artichokes! OMG I love grilled artichokes! In all honesty I’m not usually a fan of artichokes for some reason but anything and everything is awesome when grilled including artichokes. I can’t believe how many times I just typed the word “artichoke” correctly. Artichokes on the grill–why didn’t I think of that? I’ll pretty much throw anything on the grill. 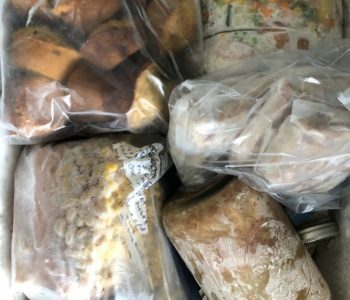 It always tastes so much better than from the stove or oven. Thanks! Um, dumb question…do you eat these the same as if they were just steamed?? I e never had a grilled artichoke before. I thought I was the grill queen (and the artichoke queen) but I’ve never thought of grilling artichokes before! I have the same question as Rachel, above me. How do you eat these? Presumably, even with a combination of boiling/grilling, parts of the leaves are still too fibrous/woody to be eaten. 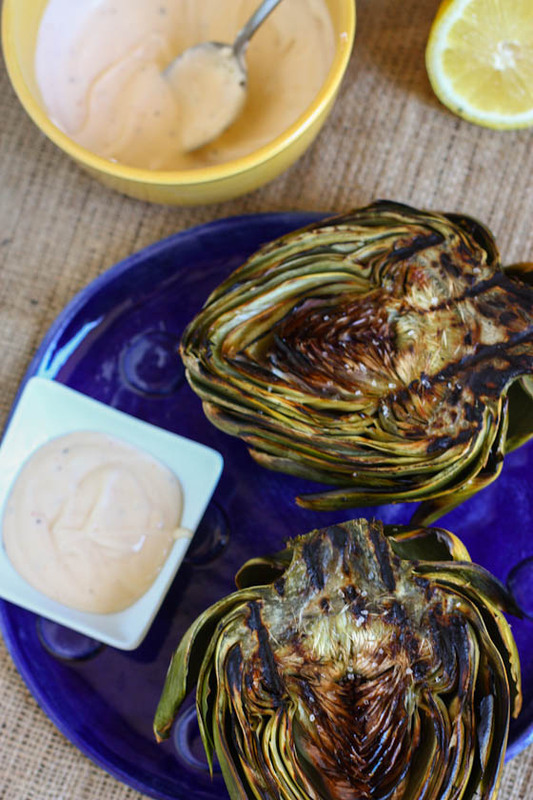 I’ve been wanting to try grilled artichokes – these look amazing! I just recently had artichokes for the first time where I did not hate them and I’ve sort of been craving them ever since. 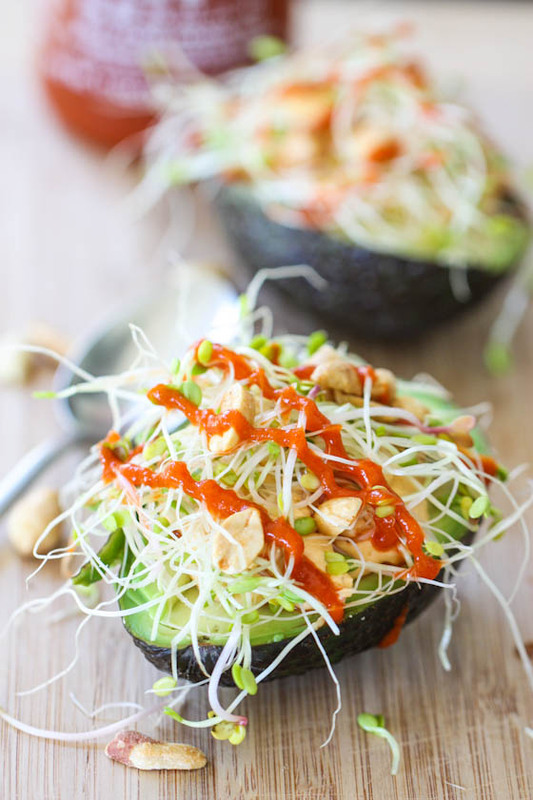 This is an awesome way to get some greens into my diet….which is generally lacking in them. Yum. I’ve only actually tried this out at restaurants. you’ve motivated me to make a homemade version!